From the totally spaced out mind that brought you hard hitting sample packs like Electro Magnetic Fury and Electron Smasher, Android Nightmares is the latest release from Perry Geyer of Cybersound. 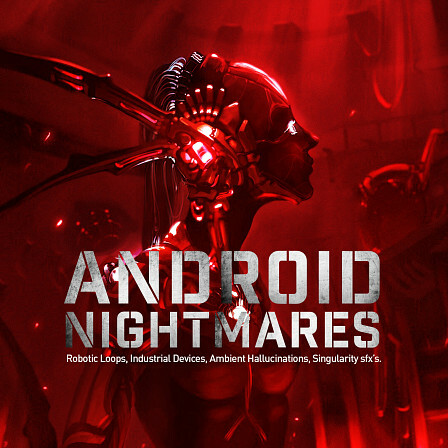 Laced with 100 menacing beats, warped out loops, and in your face robotic FX; Android Nightmares is ready to blow the lid off your latest audio creations and inject some system-critical attitude into its digital DNA. With a dizzying yet perfect blend of creepy atmospheres, morphing rhythms, and hostile breaks, Android Nightmares will push you over the edge. The machines will take no prisoners when it comes to your film & TV soundtracks, video game scores, and other music projects. This is digital audio warfare. This is the soundtrack of the singularity. This is Android Nightmares.